FOSS tubes are made of non-vulcanized composite elastomer (EFT). In case of a puncture, the tube will form a hermetic seal around the nail, the spine, or the piece of glass. If the object is no longer in the tube, it reduces the puncture in slow puncture, leaving time to go back home safely. Elastomer also provides better resistance in case of pinching. 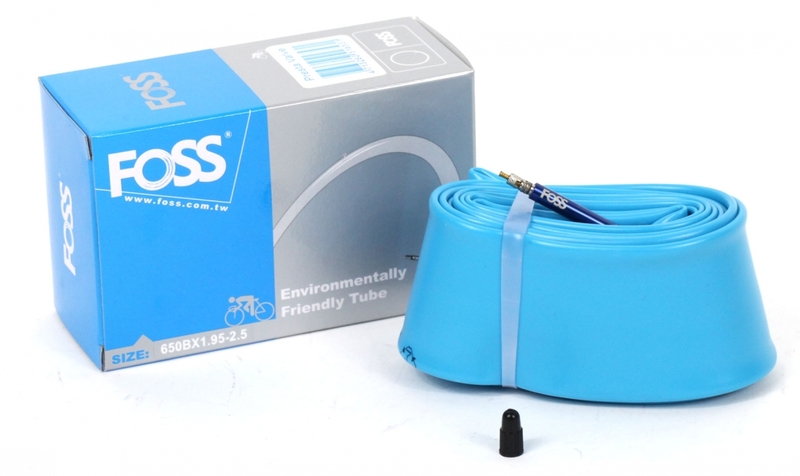 FOSS inner tubes are about 30% lighter than traditional tubes. With a density of only 0.88 g / cm3, elastomer is significantly lighter than traditional rubber tubes which has a density up to 1.3 g / cm3. Made of non-vulcanized composite elastomer, these tubes are recyclable. Do not try to inflate the tube if it’s not inside a tyre. Excessive inflation may distort the tube. FOSS tubes are not suitable for carbon rims. An increase in temperature due to braking can blow tube. The junction of the tube must be at the valve. Refer to the instruction manual. The tubes do not come with a FOSS rim tape, as shown in the picture. 50 mm Presta valve, with removable valve core.